Music Teacher LA founder, Olesya MacNeil, graduated with Masters Degrees in Music, Psychology and Pedagogy and has been providing quality private piano lessons since 1991. She was a very sought after and popular piano teacher in Westwood, LA neighborhood and taught children of Larry King, Billy Baldwin, Dan Beckerman (governor of LA Kings), and many other local families. She assembled a team of highly professional and experienced musicians who share her burning desire and enthusiasm for quality music education. Learn more about our founder here. Read more about the many benefits of hiring our Westwood piano teacher here. 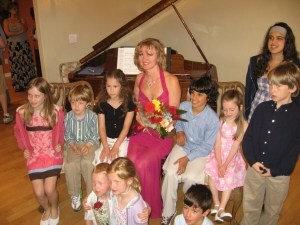 My kids and I had such a wonderful experience with Olesya as their piano teacher. She began teaching them when they were five and six years old. Both my boys enjoyed having Olesya visit each week with fresh ideas and a fun attitude towards learning piano. It was always a fun hour and they looked forward to practicing piano each day so that they can show Olesya how much they had learned when she would come back each week. Her approach to teaching has been a wonderful experience for my children and it even made me want to start piano lessons again. Jennifer from Music Teacher LA has been my violin teacher for over a year, and I could not be more pleased to recommend her to any family. I came to Jennifer as a complete beginner, as I had wanted to learn violin ever since I was a child. Jennifer has an excellent method for starting students out, and is very patient with my shortcomings. She doesn’t try to push me too hard and really takes the time to get to know my learning style. She has always given me assignments that are challenging but manageable at the same time, so I always feel accomplished by the next lesson because I am able to execute the exercises at a satisfactory level. Jennifer doesn’t overwhelm her students with too much information too soon, rather giving me just the right amount of things to focus on so I can steadily improve. She always makes sure the lessons are fun and creates different exercises constantly. She also searches for new ways of teaching and that way makes me learn much quicker with this creative process. 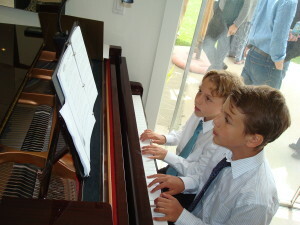 Our Westwood LA piano lessons are tailored to each student’s tastes, needs and learning pace. Students study ear training, notation, rhythm, technique, memorization, sight reading, improvisation and music theory. Music Teacher LA also offers composition and music production per students’ requests. If you do not have a piano at home, a simple full-range electronic keyboard with weighted keys will be sufficient for the first six months. Our piano lessons are offered seven days a week in the comfort of your home in Westwood, Los Angeles or in our Santa Monica studio. Our Westwood LA piano teachers are ready to begin your musical journey!